Tolbert and Fowler challenged Smith to a ghost-town cook-off. The bean question would be settled in Terlingua, a former mining outpost near the Mexican border, on Oct. 21, 1967. In what came to be known as the Great Chili Confrontation, Fowler represented Texas; Smith spoke for New York and the rest of the wide world. Three judges would decide the outcome: Terlingua Mayor David Witts; San Antonio brewmaster Floyd Schneider; and Hallie Stillwell, a judge from Alpine, Texas—who happened to be Smith’s cousin. Schneider pulled the lever for Fowler’s Texas chili. Stillwell, who of course knew her cousin’s recipe by its bean-y texture, voted for Smith. The swing vote, Witts, took one bite of Smith’s New York bean “chili” and declared himself poisoned. His taste buds were ruined, he sputtered, according to accounts of those who were present. Witts was unable to try the other chili in good faith. No winner was declared. Ever since then, beans have been forbidden in the annual Original Terlingua International Championship Chili Cookoff. And yet beans are a feature of nearly every so-called chili served outside Texas. I say so-called because even though beans are unlikely to permanently damage your taste buds, they are anathema to chili. Put plainly, beans do not belong in chili. And non-Texans’—especially New Yorkers’—repeated attempts to add beans to this regional specialty only reveal their own arrogance and ignorance. The Super Bowl seems like a good time to correct the categorical error that people make when they think about chili. Folks tend to consider it as a genre of food, along the lines of sandwiches or tacos—an open-source dish, as in steak sandwich, chicken taco, tofu chili. (More on that in a moment.) But chili is perfect, complete, and not open to discussion. It is a proper dish with a proper name, something closer to the Cobb salad or French onion soup, except better than either of those things, because it is chili and not salad and definitely not French. Chili has a concrete history. The dish of meat, cooked up with dried chilies and spices, got its start in San Antonio, rising in prominence with the city’s fortunes during the Mexican-American War. The women known as the Chili Queens of San Antonio had set up shop in the fort town’s airy plazas decades before that war—earlier, even, than the Texas Revolution that preceded it. Generations of these women, mostly but not entirely of Hispanic descent, cooked chili and other wares over open fires from dusk till dawn. The Chili Queens fed cowhands in peacetime and soldiers in war; both groups spread stories of San Antonio’s chili con carne far and wide. With the arrival of the railroad in San Antonio in the 1880s came journalists who wrote romantic accounts about San Antonio’s peculiar street-food markets. Stephen Crane, the author of The Red Badge of Courage, described chili as “pounded fire-brick from Hades,” which sounds like a surefire compliment if I’ve ever heard one. In the 1904 short story “The Enchanted Kiss,” which is set in turn-of-the-century San Antonio, O. Henry describes “the delectable chili-con-carne, a dish evolved by the genius of Mexico, composed of delicate meats minced with aromatic herbs and the poignant chili colorado.” At no point was chili made with beans: This we know from star-struck accounts of foreign visitors, even if we don’t have the recipes used by the Chili Queens themselves, who were eventually evicted by NIMBY authorities citing health code concerns. Were it not for that Dallas journalist, Tolbert, we might not know so much about chili today. Tolbert traced the history of chili throughout the state for the Dallas Morning News, where he started as a columnist in 1946. He paid attention to towns where street-food chili vendors had erected brick-and-mortar restaurants known as chili parlors, especially in the former military towns along the border. Tolbert published the first history of chili, A Bowl of Red, in 1953, and one of the finest chili recipes ever produced. (It was Lady Bird Johnson, though, who stoked the national appetite for chili most when she published Vice President Johnson’s recipe for Pedernales River Chili in the Washington Post in 1961.) Thanks to Tolbert and others, the origins of chili are not only knowable, they are known. So when a cookbook author like Mark Bittman writes—in How to Cook Everything—that chili means “slow-cooked red beans seasoned with cumin and chiles,” he betrays his ignorance of the dish and its history. When he writes that a true chili dish, one made with meat and no beans, has “entered the realm of cassoulet,” he might confuse chili-heads who don’t know what cassoulet means—but they’ll always recognize when someone’s messin’ with Texas. It’s when Bittman advises amateur cooks to make chili with tofu or espresso that he is doing something worse than disrespecting the dish—he is suggesting that the names of foods can mean whatever the speaker wants them to mean. Similarly, when Julia Moskin claims in the New York Times (as she did this month) that Texans “do not have a lock on authenticity” when it comes to chili, she disregards the very history that brought it to prominence. Texans have words for the things that aren’t chili. Goulash is one of them, as Moskin rightly notes. (I grew up on goulash: a guisado cooked with paprika and pintos, served over al dente macaroni.) Another one is frijoles borrachos, a winter staple in my household: dried beans simmered long and low with a ham hock or salt pork and half a six-pack. There are other things that aren’t chili, too: Chicago-style deep-dish pizza, Montreal-style bagels, New England clam chowder, and dozens and dozens of delicious spicy bean stews. Words mean something, and for the richest words, it’s worth protecting that meaning. When we do, we safeguard and pass on the regional peculiarities that made this nation interesting in the first place. Even New York can boast a few dishes of its own, I’m told. So chili: no beans. 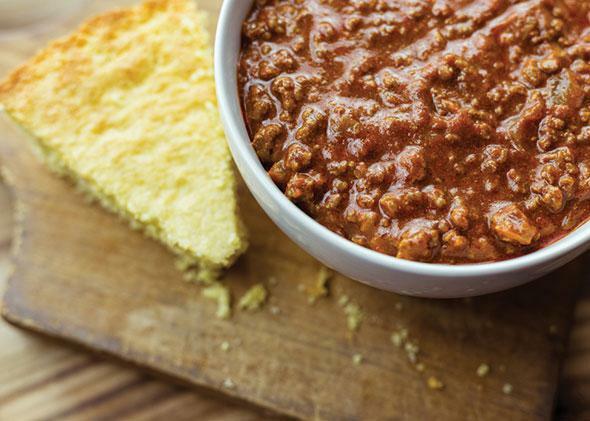 Chili is beef plus hot and smoky. No macaroni, no cinnamon (c’mon), and certainly no tofu. Chili is good over Fritos, but just remember, then it’s called Frito pie. Nobody cares what you put on top of chili. Cilantro, cheese, sour cream—have a party. Frankly, Texans are all too happy to share for the Super Bowl the party we’ve been enjoying for a couple hundred years.